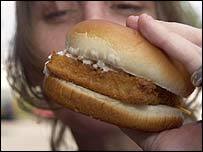 Eating fast food more than twice a week has strong links with weight gain and insulin resistance, a US study shows. This suggests eating too much 'junk food' increases the risk of obesity and Type 2 diabetes, the Lancet study says. Boston Children's Hospital experts followed more than 3,000 young people's eating habits over 15 years. But other experts said people who ate a lot of fast food were also likely have generally unhealthy lifestyles, increasing their risk of disease. The 2004 film Supersize Me documented the effects on health of eating nothing but fast food for a month. Documentary maker Morgan Spurlock gained 25lbs, and saw his health worsen. Statistics for the UK showed that in 2001, 21% of men and 23.5% of women were obese. Nearly two thirds of men and over half of women were overweight or obese. The US study looked at the eating habits of 3,000 African-American and white adults aged between 18 and 30. Participants were asked about their lifestyles, including diet, exercise, smoking and leisure habits at the beginning of the study then again after two, five, seven, 10 and 15 years. Those who visited fast-food restaurants more than twice a week (87 people) gained on average an extra 4.5kg (9.9lbs) and had a two-fold greater increase in insulin resistance compared to those who went less than once a week. Overall, it was found that white women ate fast food the least, with an average of 1.3 visits to restaurants per week. Other ethnic groups averaged two visits a week. Dr David Ludwig, who led the research, said: "Fast-food habits have strong, positive, an independent associations with weight gain and insulin resistance in young black and white adults." He added: "In view of the high and increasing rates of fast-food consumption, further research into the effects of this dietary pattern on public health should be given priority." In a commentary in the Lancet, Professor Arne Astrup, of the research department of human nutrition at Denmark's Royal Veterinary and Agricultural University, said the study was limited because it relied on people reporting their dietary habits accurately. He warned the study failed to ask people whether they chose the larger portion sizes, or 'supersized' when they visited fast-food restaurants, a factor he said was a established factor in making people consume more. Professor Astrup said the fast-food industry would argue there was little compelling evidence to show large portions were damaging health. But he said: "Appropriate action would be to reduce portions to normal sizes and to sell burgers of lean meat, whole-grain bread or buns, fat-reduced mayonnaise, more vegetables, lower-fat fired potatoes and reduced-sugar soft drinks. "Although the price may have to be increased, at least such changes in fast-food meals can have no adverse health effects." Professor Astrup acknowledged that some fast-food companies had launched some healthier choices, such as porridge and fruit, in their restaurants. He added: "I hope that this trend continues."